Originally created by Argonaut Software, the Star Fox franchise was acquired by Nintendo for the N64. 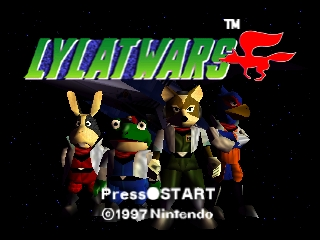 Due to copyright issues, Star Fox 64 was renamed Lylat Wars for the European (and thus, PAL) version - a reference to the Lylat System in which this excellent game is set. Lylat Wars is in essence a 3D Flying game set in space, but also with levels on various planets, orbital bases and even on the surface of a star. 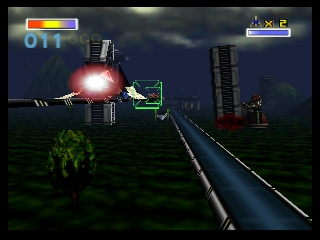 Each level revolves around destroying armadas of enemies, (with lasers, bombs - or even by crashing into them at high speed) as Fox McCloud (the player's character) and the Star Fox team (comprising Falco Lombardi, Peppy Hare and Slippy Toad) make their way towards the planet of Venom to meet their foe, Andross. Although the main character is quite reserved, his loquacious co-pilots and talkative enemies make the game highly entertaining. There are two different modes of play. In most of the levels, Lylat Wars is 'on rails' - that is to say, the player keeps flying forward and cannot do a U-turn. The rest are in 'all-range mode' in which U-turns are indeed possible, and thus, full 3D movement. The two different styles of play tend to complement each other, though I found the former more strenuous. The game is meant to be played and completed in one sitting: there is no saving system. This may seem awkward, but because a maximum of seven of the game's fifteen levels can be played in a single attempt, it is manageable. Nonetheless, one will have to allocate at least one hour for the full single-player experience. A comprehensive training mode prepares the player for the game; there is also an enjoyable split-screen multiplayer mode. Last, but not least, there are two levels that are played in tanks, and one in a submarine. Excellent performance in any level earns a medal - and medals in all fifteen levels open up special options. In order to keep this description brief, I have avoided commenting on the storyline, music, sound-effects, graphics, power-ups, etc... It suffices to conclude that anyone who enjoys a videogame that involves action, destruction and humour will simply adore this game, which, in my view, is the apex of the Star Fox series. Also known as Starfox 64. Now you can add videos, screenshots, or other images (cover scans, disc scans, etc.) 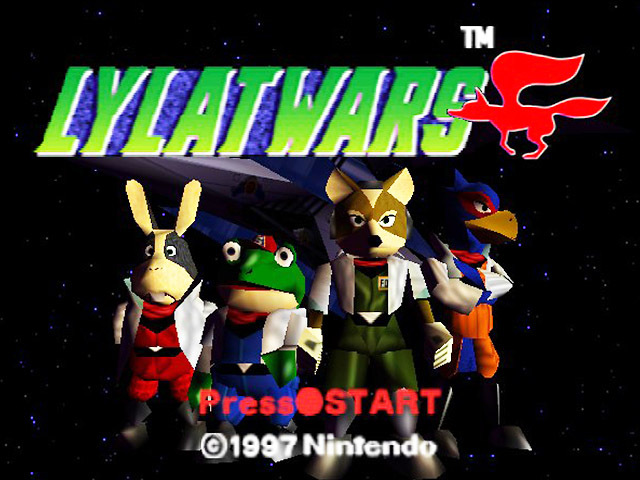 for Lylat Wars (Europe) (En,Fr,De) to Emuparadise. Do it now! If you haven't noticed yet, we have a retro game of the day feature (top-right of the screen) wherein we feature a new retro title every single day! Now, you can vote for your favorite games and allow them to have their moment of glory. Click on the button below to nominate Lylat Wars (Europe) (En,Fr,De) for Retro Game of the Day.